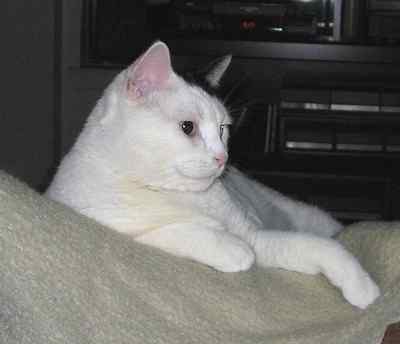 Tom writes, "In the summer of 2000 I found a cat who had been abandoned by some heartless people when they moved out of the complex I lived in. At first I planned on finding a home for this adorable creature and I wrote to Kitty Angels asking for advice. You were kind enough to help me learn what to do even though I'm not from the Boston area. I got Nikki her shots and got her spayed and made sure not to let her roam outdoors, per your advice. I ended up keeping her instead of finding her a new home. "She's been a wonderful companion for me ever since. She's very even tempered and affectionate. She prefers to stay in whatever room of the apartment that I'm in. When I'm done watching TV in the living room, she follows me into the bedroom and stays with me while I work on the computer. She drinks water like a human. Instead of drinking it directly from her dish, she scoops it out with her paw. I wanted to thank you for your help in becoming Nikki's guardian. Even though she has never lived in the Kitty Angels facility, you may make her an honorary member of your cat alumni if you wish." Elissa and David write, "I adopted Lucy in December 1993 when she was about three or four years old. She had been abandoned in a parking lot with her kittens, lived in a vet's office with a 'cat needs home' sign, and been returned to Kitty Angels by a potential adoptive home for not being 'friendly enough.' You picked her out for me based on my need for a quiet, mellow cat, and she's been the best friend and companion I can imagine. 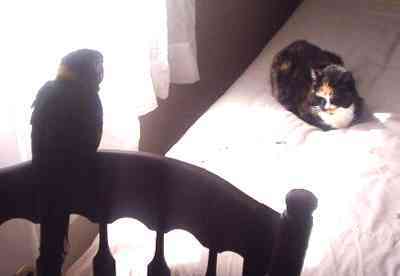 "Earlier this year, my husband took in a little parrot who would otherwise have been on his way to the bird shelter. Isn't this a great picture? They aren't exactly best friends, but Lucy can really get along with anyone and has adapted very well to being a big sister after 11 years as an only pet. The four of us sit on the couch together in the evening watching TV and sharing bowls of ice cream. Lucy is quite the kitty success story." 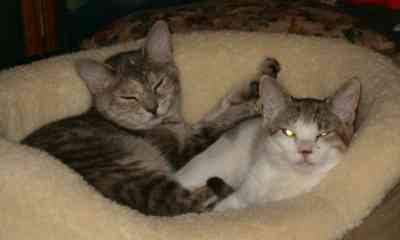 Jay and Jen write, "Sassy and Lulu have made themselves quite at home over the past year. They've trained the children very well and are just a joy. Here they are snuggling together, as usual." 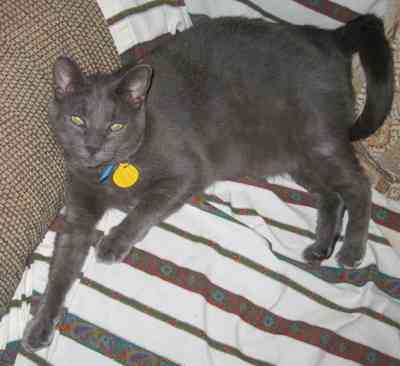 Nash was adopted in August 2005 by Bill, who writes, "Nash is pretty much all settled in now and he seems very happy! He was very shy at first as expected, but he would always come out of hiding from under my couch when I called him. Now he seems comfortable and enjoying himself. He's eating and drinking fine, at first he wouldn't eat or drink water for a few days, at least from what I saw. He's also fascinated with the fish tank. He watches the fish for 15 minutes at a time, and at times gets on his back paws to get a better view. " 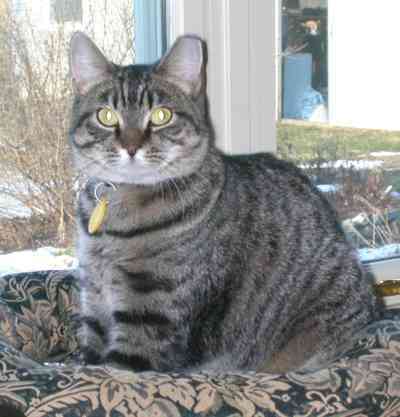 Nicole writes, "We adopted Maggie from Kitty Angels in December of 2004. My husband surprised me with her. She was absolutely the best Christmas present ever! "She quickly adjusted to her new home. She is a very happy and sweet cat. She loves to sleep on our bed with us and she loves to cuddle on a lap whenever she can. She rolls around on her back until we rub her tummy; she loves attention! "Maggie is a little shy with strangers but follows her familiy members around the house. I work from home and she is my little office mate sitting at my feet or on my desk while I work. "Maggie is very gentle with children and loves my son. "We can't imagine not having Maggie. She has made our happy family even more happy. "Thank you so much to Kitty Angels, and especially Linda who took such great care of our little Maggie before we adopted her."